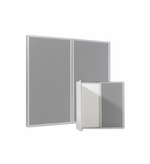 Executive conference room cabinets and whiteboard cabinets. Quality office furniture that will make any executive office or board room look spectacular. Every conference room cabinet comes with a magnetic dry erase writing surface. Some models include a pull-down, projection screen. Others have a whiteboard on the inside of the doors for more writing space. Some models like the 4 x 4 Traditional come with locking doors. 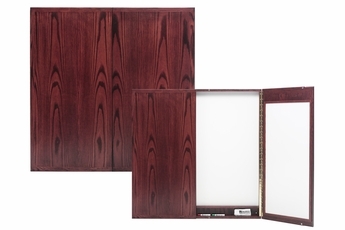 Both the Tambour door cabinet and the Euro-style unit can ship in as little as two working days. 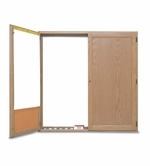 Solid Oak frame, panel match veneer doors. 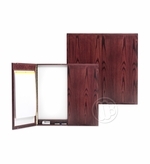 Solid 4x6 Oak cabinet frame, panel match veneer doors. 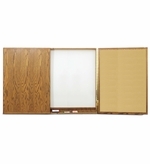 4x4 Locking oak dry erase cabinet made of solid oak construction.